Boring Science – From SpongePedia, the biggest SpongeBob-wiki in the world! 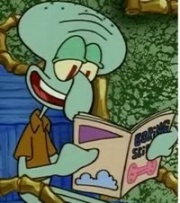 Boring Science is a magazine that Squidward reads in the season 1 episode The Paper. It is about boring science facts like erosion and mitosis. Squidward said that it was "fun" (although he might have just said this to get his mind off of Mr. Paper). This page was last modified on 6 November 2012, at 23:54. This page has been accessed 13,857 times.